Drone raises vital questions not only about how drones shapes the modern military experiences, but also about how drones reshape moral ground. "It's this surgical precision, the ability with laser-like focus to eliminate the cancerous tumor called an al-Qaida terrorist, while limiting damage to the tissue around it. That makes this counterterrorism tool so essential." "We thought we were smarter than the Bugs." "We see the drones, they look like birds." As Zubair Ur Rehman speaks, you see a drone, far away in the blue sky. "The drones circulate 24 hours a day," Zubair goes on, "When we hear the sound of the drones, we get scared, we can't work, play or go to school." "We" includes the young children and old men who turn to look into the camera in he opening moments of Drone, a series of portraits from North Waziristan showing the dread, disquiet, and fatigue produced by US drone campaigns. Most of these faces don't have names, so that Tonje Hessen Schei's documentary creates its own effects. For one thing, the film, screening at AFI Docs, underlines that whole communities are terrorized by drones on a daily basis. For another, it makes clear that these communities are comprised of "innocent civilians", exactly the people who are presumably not targeted because of the drones' "surgical precision". The film goes on to bolster this visual argument through multiple interviews with people who do have names. Victims like Zubair, human rights activists, former drone pilots, journalists, and writers all bring different perspectives to the dilemma posed by drones. None of these perspectives is simple, all of them are disquieting. Former drone pilot Michael Haas remembers that his control room in Nevada featured "a picture of September 11, the plane hitting the second building, just to try to make you pissed off about it all over again before you go do your job. 'These guys have to die, these guys deserve to die, and you gotta make it happen." While this motivational strategy is hardly news -- young men can only go to war if they believe their opponents are enemies, not human, not like them -- the added value here is the distance from the act, the lack of what Lawrence Wilkerson calls "vulnerability". The effects of killing by drones on the killers may be largely unknown as yet, but it's clear enough that drones do not, as John Brennan asserts, "conform to the principle of humanity, which requires us to use weapons that will not inflict unnecessary suffering." That suffering takes multiple forms, some acute, others insidious. "This is a very different youth group that we're forcing into this environment of killing," says Wilkerson, an environment that obscures the "difference between killing in a way that is recognized and legalized even, and murder." If this too is not precisely a new question (the distinction between war and murder has long been subject to debate), but Wilkerson highlights the increasing complications brought on by drones and also, the concept that the entire world is a war zone, so that the US might strike anywhere without compunction or consequences, no matter the damage done. Some of this damage seems immediately visible but is mostly disavowed by official entities. Human rights lawyer Shahzad Akbar has brought a legal case against the US and Pakistan, for allowing drone strikes to go on. The film shows that he and his partners at Reprieve represent victims and survivors of attacks, who are, increasingly, organizing to make themselves and their cause visible in media worldwide ("This is not just a legal case, Akbar says, "it's more of a campaign"). Drone explains other, less conventionally visible damage, including that done to drone pilots. Brandon Bryant describes his experience in steps, from his early belief that it might be like playing a video game and his success as a pilot (by his estimation, 1,626 kills) to his current PTSD and apprehension that, with his testimony before a 2013 United Nations panel on the US drone program. His decision to speak out against that program, Bryant says, has made him a target of the "drone community", former friends have "bashed" and threatened him. While the very term "drone community" is chilling, Bryant's story sounds like those told by other whistleblowers. His experience provides a kind of backbone for the rest of the documentary, which includes corroboration and elaboration in the form of drone-targeting footage and interviews with experts on ethics, technology, as well as war. As drone warfare blurs the lines between targets and non-targets, Drone submits, it makes terrorists of those who wield such weaponry and, of course, creates more terrorists out of outraged survivors. By the time the film shows President Obama accepting the Nobel Peace Prize in 2009 -- "The United States of America must remain a standard bearer in the conduct of war. That is what makes us different from those whom we fight" -- it has already revealed that the US is not very different at all. As Drone explores this lie and others, it considers as well how they are sustained, whether by degrees of self-deception or by abject cynicism: at least some proponents of the technology make huge profits off such warfare, and the US keeps secrets by claiming the campaigns are CIA, even as they are conducted by the US military, not so "classified" or immune to charges of war crimes) the war under "classified." 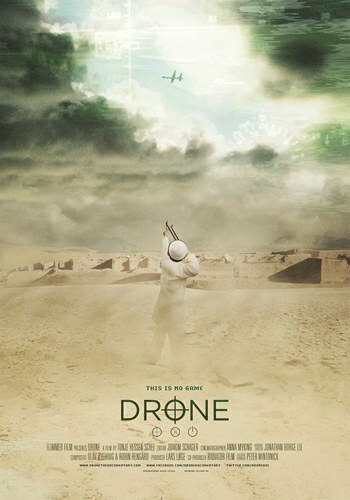 The movie sometimes offers reductive correlations (a sequence of archival recordings shows the Stanford Experiment to illustrate "the psychology of distance," Eisenhower's voiceover reminds you of the "military industrial complex," a few shots of a military weapons showcase feature corporate logos) and a disorganized argument, with some points repeated and others left undeveloped. Still, Drone raises vital questions, not only about how drones shape experiences of targets and shooters, institutions and corporations, but also about drones reshape moral ground. "The United States has become a national security state whose raison d'être is war," observes Wilkerson. "We've created a terrorist-industrial complex that is self-perpetuating, and now, searching for the reason for this constant state of war, terrorism is the perfect case for us. We can do this forever."